avid Trevellyan takes a lonely late-night walk between a restaurant and his New York City hotel. A familiar huddled shape in the mouth of an alley catches his eye. A homeless man has been shot to death. Trevellyan steps forward...and a police car arrives. A split second too late, Trevellyan realizes he's been set up. But Trevellyan isn't worried. He's a survivor from the shadowy world of Royal Navy Intelligence. Used to working undercoversometimes with the approval of his masters, and sometimes nothe's been in and out of trouble a thousand times before. But the NYPD quickly hands the problem to the FBI. Trevellyan is sucked deeper into the system. And just when he needs them most, his bosses in London turn their backs. You don't get madyou get EVEN. 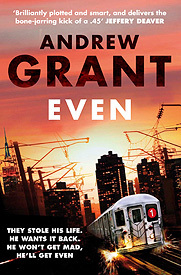 "Andrew Grant's debut novel reads like it was written by an old pro with new things to say. Even is a bit of LeCarré and Ian Fleming, but with more grit and a sharper edge. Wonderful sardonic wit and crackling dialogue." "In Even, Andrew Grant introduces British naval intelligence officer David Trevellyan, a man born to fight and trained to win, locked in a suspenseful contest with terrifying adversaries. An excellent thriller that feels like breaking news." "The first paragraph is a whopper. . .the last one made me gasp. With surprise. With delight. David Trevellyan is by turns witty and wicked. Fans of 007 will be shaken and stirred." "Modern noir at its best . . . Even is brilliantly plotted and smart, and delivers the bone-jarring kick of a .45. Here's hoping author Grant is hard at work on the next installment featuring his thoroughly compelling tough guy hero, David Trevellyan." "Andrew Grant storms onto the scene with a thriller that is pure entertainment. He has a relentless writing style that is grippingly addictive and heralds a remarkable talent in the making. I couldn't put it down." "Move over Jason Bourne. British Marine David Trevellyan can outwit, outmaneuver and overpower the best of them in this rocket-ride of a thriller. 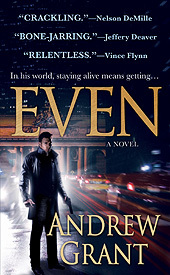 I always like a man who knows how to get even..."
"Even is a slam-bam humdinger of a thriller, with breakneck pacing that won't leave you even a moment to catch your breath. Andrew Grant has created a hero so intriguing that readers will surely clamor for the next book in what I hope will be a long-lived series. I will certainly be looking forward to it!" "Think a young, British, Jason Bourne framed and trapped in New York City and running for his life. Think about a new author on the scene who writes action like a veteran. Think about trying to put this book down, and then clear your calendar: it ain't going to happen."